A new version of Dante Via audio networking software is available, which increases application support to 16 x 16 channels, and adds ASIO device support, adjustable source mixes and new Device Lock protection. Dante Via connects all computer-based audio, including USB, Thunderbolt and PCIe devices as well as audio applications, to any Dante audio network. Fast and easy to use and sporting an intuitive drag-and-drop interface, it features automatic discovery of all audio applications, devices and Dante network endpoints. Dante Via 1.1 supports up to 16 x 16 channels of audio for each application and up to 32 x 32 for each connected device. 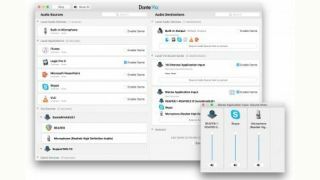 Users can now make audio connections between multiple applications and devices within one computer, or between multiple computers using Dante audio networking. By extending existing, cost-effective computer-based I/O over a Dante network, systems for overflow rooms in schools, business and houses of worship are easily created and deployed as needed, with only a few mouse clicks. This story originally appeared on Installation-International. Click here to read the original post in full.